The centenary celebrations of Calcutta’s only fire temple or agiari in operation at 91 Metcalfe Street, or Bandook Gali, began with a ceremony both warm and colourful early on Tuesday. The city’s Parsi population may have shrunk to 600-strong but they were present in full force at the Late Ervad Dhunjeebhoy Byramjee Mehta’s Zoroastrian Anjuman Atash Adaran established in 1912. Senior citizens are in a majority in the city’s Parsi community now, and they were dressed to the nines for the occasion — many of the men in brilliant white coats or daghlis modelled on angrakhas and trousers, and women mostly in antique saris elaborately embroidered in China known as garas. The saris were in rich plums, red, peach, pinks and cream, and those with borders had Chinese or Swiss designs. Among the women were Hilla Bilimoria, who is 102, and Perin Dastoor, who is as old as the temple itself, but still going strong. The women with their heads covered sang a verse in Gujarati welcoming the celebrations. 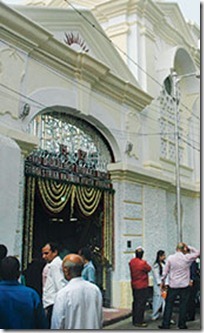 The Parsis of Calcutta will celebrate the 250th anniversary of their arrival to this city in another five years. Dadabhai Behramji Banaji of Bhagvandi in Surat was the first to be here. His relative Rustomji Cowasjee Banaji came in early 19th century, and apart from being a prominent citizen, he founded an agiary in Ezra Street in 1839, which is now decrepit and encroached on. Dhunjeebhoy Behramjee Mehta, after whom the agiari was posthumously named, came to Calcutta in 1846 and soon began trading with China. He started Empress of India Cotton Mills in Serampore, and after a dispute with Banaji, decided to set up a place of worship in his own house, for which the sacred fire was brought from Navsari in Gujarat. After his death, his wife, Khorshedbai, and son, Rustomejee, decided to fulfil his wishes with handsome donations from the family as well as members of the community and the second fire temple was established. It was consecrated on October 28, 1912, with great pomp and splendour. The fire that had been brought from Navsari for the Mehtas’ own house was installed here. The temple plot measures about 900 sq yards and the fire in a giant urn installed on the first floor is out of bounds for non-Zoroastrians. It has about 11 stained glass windows with Zoroastrian themes and motifs designed by Katayun Saklat. The ground floor has an old grandfather clock on which is inscribed: Specially made for RD Mehta Esq by J&T Foster, 12 Mayes St, Manchester 1908, January. The squat building was painted for the occasion and beautifully decorated with flowers and orchids. The ceremony was rounded off with a sumptuous lunch comprising fish (considered auspicious) steamed in banana leaves, curried chicken with chips, and pulao daal followed by custard pudding.